George Willmott, son of George & Annie Willmott, was born at Selston and later lived at New Westwood. 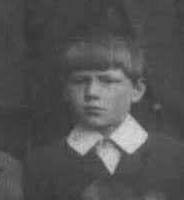 George was a pupil at Ironville School in 1906 (along with fellow classmates Leslie Lemon and Harry Heald who also fell during WW1). George almost lost his life in 1905 when he was saved from drowning by Percy Lemon, elder brother of Leslie Lemon. Private George Willmott enlisted at Eastwood, Nottinghamshire, date unknown. He was killed in action whilst in the attack on the German trenches near Lechelle, France on Wednesday 18th September 1918, less than two months before the Armistice, age 22. He has no known grave and is commemorated on Panel 7 of the Vis-en-Artois Memorial, Pas de Calais, France. The Vis-en-Artois Cemetery also contains the Vis-en-Artois Memorial. This memorial bears the names of over 9,000 men who fell during the period from 8th August 1918 to the date of the Armistice in the ‘Advance To Victory’ in Picardy and Artois, between The Somme and Loos; and have no known grave. George was awarded the British War and Victory Medals. In December 1918 personal effects amounting to £3 5s 10d were sent to his father George, followed by a war gratuity of £3 in December 1920. George’s younger brother 285345 Gunner Wilfred Willmott, Royal Field Artillery is recorded on the Jacksdale War Memorial as having served during the Great War but was actually also a casualty of the war, dying on 15th December 1919, at the tender age of 20, from ‘Black Fever’ contracted whilst serving his country. Wilfred is buried in St Mary’s Churchyard, Westwood marked by a Commonwealth War Graves Commission headstone. George Willmott is now recorded as ‘C Wilmott’ on the Jacksdale War Memorial but as ‘G Wilmott’ on the plaque situated inside St Mary’s Church. On the original unveiling Roll of Honour he is also listed as ‘G Wilmott’. His name and initial have, therefore, been wrongly recorded on the Jacksdale War Memorial perhaps, in part, during its restoration and re-engraving in 1997. 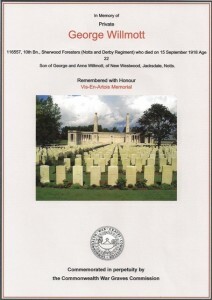 The name plaques were badly eroded and it is likely that a ‘G’ was mistaken for a ‘C.’ The Sherwood Foresters Roll of Honour records his name as George ‘Willmott’, being spelt with two ‘L’s. It is interesting to note that Private John George Jepson, (recorded on the Jacksdale War Memorial, also of the 10th Bn Sherwood Foresters, killed in action on 20th October 1918, also aged 22 years), has a service number of 116572. This is only 15 numbers on from George Willmott. 50140 Private James Ernest Green of the Essex Regiment (formerly 64918 of the North Staffordshire Regiment) killed in action on 12th October 1918, aged 26 years, is also commemorated on Panel 7 of the Vis-en-Artois Memorial. George’s rescuer of 1905, Percy Lemon, is also listed on the Jacksdale War Memorial as having served during World War One and was promoted ‘from the ranks’ to Lieutenant.